Reliant Engineering Ltd. was established in 1935 to make 3-wheeled delivery vans powered by Austin Seven engines. In 1953 they brought out their first passenger car--the Regal. The car was built to comply with the government’s arbitrary 896 pound weight limit, so that the owners could take advantage of road tax and driving license requirements. The Regal series was loved by many people because the unusual combination of qualities results from it's makers aim to produce a normal car on three wheels rather than a miniature vehicle. 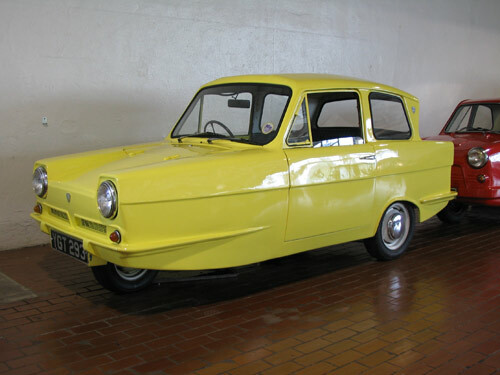 Reliant was booming in the mid-70s with their 3-wheeled vehicles - producing 350 per week. It has a fiberglass body with two wheels in the rear and one wheel in the front; the car has a peculiar look. 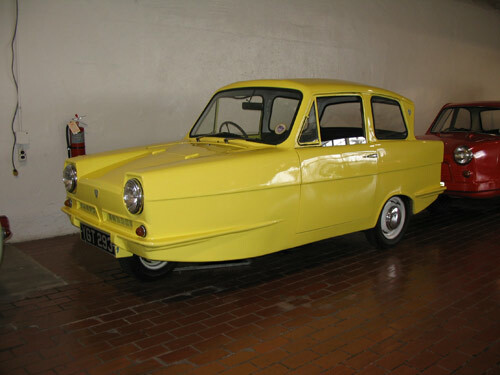 Production of the Regal ceased in 1973 with the introduction of the Reliant Robin. Reliant stopped producing cars in 2003. Manufacturer: Reliant Motor Co. Ltd.